Attention teachers early in your career! Dear Toni presents an intriguing lesson idea for journal writing. When Gene Tuck moves to a new school, one of the first assignments she is is given, is to write a journal to another sixth grader. The intriguing part is that the students are writing to sixth grade students, 40 YEARS IN THE FUTURE! Cool, right? The problem is that Gene is unhappy in her new school and this "lame" journal assignment just adds to the frustration. Gene's family is forced to move away from the only home she has ever known due to her father losing his job. When they move, they live in a small, run down apartment until her father finds a job. When her teacher assigns the journal project, writing for exactly 100 consecutive days, to a future sixth grader, Gene nearly loses it. Her writings start out very negative and petty, but as she goes on, she finds that the journal allows her a release for her new school stress and doodling creativity. At first she addresses her entries to Dear Nobody because, as Gene says, "you have no body!" As her attitude changes the recipient of the journal gets the name Toni and the entries begin to get more positive. As the reader you get to go through a lot of Gene teen angst from trying to fit in with the popular kids to losing a new best friend. Now I know that none of you can have your kids write to a class 40 years in the future, but what about 10 or 15? If I was earlier in my career I would be all over this concept. I'm not sure I would put the 100 days on it or if it would be an entire year project. Include newspaper headlines of the day, prices of common items, reflections on class and extracurriculars. When the year is over, stick them away, I would probably have to write a note to remind myself where I put them, and pull them out in 10 or 15 years. I would think that the number of years needs to be long enough that the class that writes them is well out of high school for a better impact. Somehow, giving the journal a sense of purpose, seems like it might make the writing more real to the students. In Dear Toni, the teacher doesn't grade the journals, but keeps tabs to make sure the kids are keeping up, I could go either way on this, maybe making some of the entries for grades and others not, either way, I think this could be a pretty awesome experience for kids, especially if it was possible to contact them in the future and invite them back when the journals are distributed. 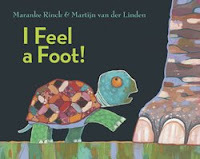 I liked this book pretty well and think kids will too, it's written in a very kid friendly voice. Seeing Phantom of the Opera on Broadway. The kids, especially Meredith have enjoyed the movie version, and since they are both involved in the drama programs at their schools, third row seats were a treat. We also took in Shrek! The Musical, Steven's choice, which was EXTREMELY funny and entertaining, I highly recommend it to anyone going to NYC. A delicious dinner in Little Italy where we were enticed into the Bueno Notte restauran t by a charming man singing That's Amore and offering free sangria to Kathy and me. Standing where the Lovely Mrs. Prosser's great grandmother first set foot in the United States. My two great kids getting along, which, as they get older, happens more and more. They actually seem to enjoy each other's company and laugh together often, it makes my heart smile! 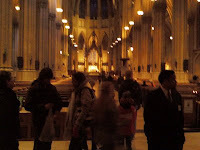 Being inspired by a beautiful cathedral and saddened by a sculpture damaged by terrorists. ...and having a laugh at Dad's expense when he had a hissy fit because he needed coffee and couldn't find a Starbucks soon enough! Thanks for indulging me on this sort of personal post, sort of unusual for me, but it was a great week and I wanted to share it with you. Monday I'll return to school for the sprint to the finish and even though it wasn't a relaxing four days, it was energizing and awesome to reconnect with my family. We're both on Spring Break this week and as you can see we are having very different experiences. While Karen relaxes in the sun on a cruise ship, I'll be fighting the crowds of New York City. I'll have plenty of time to read on the 9 hour drive, so I'm taking Dear Toni, and The Prince of Fenway Park, I know, I know that's Boston. I haven't shared what I'm reading in THE PIT for a while, and there's been so pretty good stuff, so here goes! Tsunamii: Awesome pictures and wonderful story about a wise elderly man who saves the seaside Japanese village from a killer wave. I've already put it on my Caldecott short list. The Boy Who Went Ape: I love the pictures in this, especially those of the teacher, Ms. Thunderbum! The kids go on a field trip and Benjamin, the troublemaker, trades places with a chimpanzee at the zoo. Some very funny bits, but the ending left my first graders wondering why the book "just stopped." Mighty Casey: Even though I chose this because James Preller was coming to visit, I would have read it anyway. It's a fun take on the classic poem, and when the Delmar Dogs tied the game, we were doing the wave! 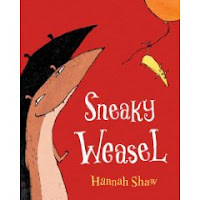 Sneaky Weasel: My friend Beth at Cover to Cover pointed this one out to me. As soon as I read it while standing in the store, I heard the Sneaky Weasel's voice. Very fun and a great lesson on how to be a good friend to boot. pers onal take on what the beast is due to their perspective. Great, colorful pictures on black backgrounds and fun dialogue made it a hit today. Did you know that James Preller came to visit our school? NO!? Well just look here, here, and here to catch up. During his visit, he talked about his new novel coming out in the fall of 2009, Bystander. Fortunately for us, he had just received the advanced reader copies right before arriving in Dublin. Double fortunately for us, he left one behind for us to read and review. This is a fabulous book. If I were a middle school teacher, I would make this required reading for all students. It is clear that James did his research on a hot topic in schools today. I sat down with the book and three hours later I was finished. For the entire three hours I was on the edge of my seat with that anxious feeling in the pit of my stomach that you get when you watch a suspenseful, thrilling movie. I was so angry at times that I absolutely could not stop reading until I had some resolution to this story. James Preller does characters about as well as anyone out there in my opinion. In Bystander, he creates a bully so believable in Griffin Connelly that the reader can't help but feel nervous when Griff is doing his dirty work. In so many bully stories, the bully is a big dumb lug that isn't likable. In Griffin Connelly, James Preller presents a real bully. A kid that other kids are attracted to, a kid that the main character describes as almost "pretty", a kid that adults trust, but also sense that something isn't quite right. Griffin is the kid who stirs the pot, gets other kids to do his dirty work, and then somehow, always gets off scott free. He is the kid other kids both fear and admire at the same time. We have all seen a Griffin Connelly on the playground. Eric Hayes is the perfect bystander. As the new kid, he is looking for friends and his first interaction at his new school is with Griffin, a few days before school starts. Due to intimidation, fear, not knowing anyone else, Eric is drawn into Griffin's circle. He doesn't really participate in the bullying, but he doesn't do anything to stop it either, classic bystander. My first reaction was to be angry with Eric, but then I realized that he was no different than a lot of kids. Real bullies, like Griffin, are extremely charismatic. Kids want the bullies to like them and so they don't buck the system, it's easier to ignore the behavior with the hope of being accepted. David Hallenback is a sad victim. Hallenback is like a whipped puppy. He is so beaten down by Griffin and his gang that he will do anything to gain their approval. Griffin and his gang are constantly tormenting Hallenback, physically and mentally. The first time Hallenback appears in the story, he's running from Griffin and friends, and he's covered in ketchup. Later in the story they get him on the playground, making sure they are out of the teacher's line of vision and physically abuse him. Eric watches, angry at the treatment, but doesn't do anything. When Eric finally begins to stand up to Griffin, Hallenback is the one who lures him into trouble. My feeling for Hallenback went back and forth between pity and anger almost at the turn of every page. The plot is believable, quick moving and well developed. At one point I had to keep myself from yelling out a warning to Eric as Hallenback lured him into the pet cemetery. Earlier, I said that I couldn't stop reading until I had some resolution and honestly, when I finished, I'm not sure I felt that I had resolution. When Karen and I discussed this, she reminded me of our conversation with Jimmy. He said that he purposely left the book the way he did, because realistically, bullies are seldom dealt with, and usually get away and move on to another victim, all true, just like this book. It's not an After School Special where everything is fixed in an hour, it's written to be believable. May the luck of the Irish be with you all today! And, if you need a good laugh, check out these 5 Dublin bloggers bringing you a little St. Patrick's cheer! Many thanks to Franki and Mary Lee at A Year of Reading for a great laugh-out-loud moment! I recently had a medical episode (for lack of a better term) that, at first glance, really seemed to stink! I woke up in a hospital, hooked up to machines, not even sure how I got there. My family gathered around my bed, concern etched on their faces. I missed a full week of school, and the week I went back, I could only work half days. My doctor has curtailed my driving privileges for the time being -- no driving for 90 days. The episode happened at school, and I do worry about the lasting impact on any child that might have witnessed it. However, when I got over my little pity-party, I began to realize that this episode, for all the stinky parts, has many silver linings as well. Silver lining #1 - Since I can't drive right now, my husband takes me to work each day. As we make the short commute to my school, we chat about what lies ahead in each of our days. We touch base with each other in a way we never did in the mornings before. When he drops me off at school, we kiss each other, say, "I love you," and then I head into the building. What a wonderful way to start my day. Silver lining #2 - On the weekends, I now do errands with my husband. We go to the grocery, the bank, the library, and the bookstore together. He even took me shopping last weekend for spring break clothes -- you would have to know my husband to know how much love that shows on his part! We spend much time in the car together, chatting about a wide variety of topics. Much different than the days when he had his errands to get done and I had mine; now, we have OURS, and it gives us some wonderful time together. Silver lining #3 - When my husband can't drive me, I have a wide group of friends who have willingly offered to make sure I get where I need to go. One group of friends each took a day of the week that I could call on their services. Another friend at my school brings me home from school every night. In addition to being grateful for the rides, I've gotten to spend lovely time with people talking, laughing, hugging, and catching up with each other, these past few weeks. What a gift! Silver lining #5 - My youngest child is a senior in high school who normally thinks the world revolves around her. She has impressed me throughout this whole thing. When I was in the hospital, she was there, even when I wasn't aware of her presence. Since I've been home, she is yet another taxi service and errand person. You don't realize how much you run out to get little items for dinner until you can no longer do it; now C does it for me, and without one complaint (ok, maybe once in a while, but not many). Having her be more responsible around the house is not a bad thing at all for our entire family. Silver lining #6 - Even though I worried about scaring the students, I am so grateful this happened at school where the people around got immediate medical attention for me. If I had stayed home that morning because of my cold the week before, I would have been all alone. How grateful I am! Silver lining #7 - I've worked at my current school for the past twelve years. I know I enjoy being with my colleagues, and my 5th grade team is the best, but I think I had started to take some of that for granted. After I got home, my school friends and colleagues overwhelmed me with their kindnesses. Their outpouring of caring and concern was amazing! I feel so fortunate to work in a setting where people care about each other like that. Silver lining #8 - Because the car hasn't been available to me, it has forced me to have a much more calm, relaxing life at home. I putter in the kitchen, I grade papers, I read, I blog, I watch TV, I talk to my family. I have found that this pace of life is quite enjoyable. Silver lining #9 - The food! Oh! My! Gosh! The food that has flowed into our home has been phenomenal, both in quality and quantity!!! Let's just say we haven't gone hungry recently! Silver lining #10 - I saw my doctor last week, and I'm going to be just fine. This was just a bump in the road. 1) You encourage the process of brainstorming, and you follow through with the concept by respecting and honorin g all ideas (no matter how silly they might be). 2) You stand in front of the group with chart paper and a marker to capture the group’s thinking because those thoughts are important for the whole group. 3) You ask the students what every mystery contains, and they tell you a CRIME. You celebrate that answer, write it on the chart, and then seek ideas for what possible crimes might have occurred at this elementary school. 4) You listen (oh so patiently) as students suggest crimes: the principal was kidnapped, a computer was stolen, or a Smartboard was stolen. You explain (oh so patiently) that a crime written for elementary students is not likely to be quite so “large” in nature. Then, someone in the peanut gallery (ok, me) makes a suggestion that a University of Connecticut flag in one of the 5th grade rooms might get stolen. As the author, you take this suggestion and write it on the chart, but at the same time bring it back to the students by saying, “Oh my gosh. I’ve never heard a good idea from a teacher before!” Students think this is hysterical, and we’re back on track. 5) Now that we have a crime, it’s time to figure out who our SUSPECTS are. You immediately make it “safe” by saying we won’t be using anyone’s name that is in the roo m. Then, you give some of the most valuable advice to them as authors for anything they write. You say we need to “show, not tell” what the character is like. If we say the character is a nerd, show a picture with words why that is so. If the suspect is a custodian who doesn’t like children, SHOW, not tell, how you know that. After we brainstorm information about 3 possible suspects, you chart the ideas, and we need to settle on one. But wait! We need to think about the next step first. 6) MOTIVE – what exactly is the motive for each of these possible suspects? You encourage us to do some rethinking about our suspects. Let’s look a little deeper and see what might make one of them take the UConn flag. Was it signed by a team that won the NCAA tournament, and therefore worth some money? Does the suspect possibly have a sick relative or pet, and they can’t pay the medical bills? You, as the author, help the students realize that things aren’t as black and white as they might seem on the surface. Did the suspect feel like he/she wa s slighted at some point by the owner of the flag? Is this some sort of retribution? With your encouragement, these are the types of motives the students are able to brainstorm as a group. 7) So many great motives. So you have the students look at another mystery element – OPPORTUNITY. We know our list of suspects, we have talked about some motives, but who had the opportunity to get to the flag? We discuss some possibilities together. 8) Time is running out, but you’ve taught the students yet another wonderful writer’s technique. You have modeled the way you think in bits and pieces all over the chart, circling and returning to certain sections over and over. You’ve shown them that brainstorming doesn’t have to be linear – line after line of possible supports for a topic – it can be cyclical. A writer can pick up a thread of thought or an idea at any time. Ideas can be messy, written all over a page, and revisited at the appropriate time. 9) Show the kids that you care about them and the writing piece you are creating together. Have that certain quality that lets students know you like them, and you’re happy to share this opportunity with them. Both of us at Literate Lives are so grateful to James Preller (he will always be Jimmy to us) for how he enriched both students’ and teachers’ lives in the two days he spent at our school. We are so blessed to have met him, spent time with him, and learned from him!! From recent posts, you know that author James Preller was here last week. Karen and I have been blogging about author visits and time spent with Jimmy for the last several days and we realized we haven't even written about his time with the kids which was fabulous. So for the next two posts we'll be sharing what happened. Day one was set up like a typical author visit, however, it turned out to be anything but a typical author visit. Each grade level visited the library for a 30 minute time with James Preller. He shared about his books, family, inspirations and life in general. I was amazed at the comfort level Jimmy exhibited in front of our students. It is clear that he is very comfortable with kids, and in fact enjoys spending time with them. At one point early in the day, I caught myself SHUSHING the younger students. That's right, the LOUD librarian was SHUSHING the kids!! They were excited about something Jimmy had just said and were reacting. He looked at me and said, "It's all right." and the next thing I knew he had complete control over the room once again. It was at that point, with the first group of kids that I knew this was going to be a great two days. Throughout the day, Jimmy changed his presentation tailoring it to the age of the students listening. The most difficult group was the last one of the day that was made up pre-schoolers, kindergartners and fifth graders. He also changed it so he didn't get bored with a canned speech. I'm thankful for this since I got to hear something different in each of the five sessions. The younger kids heard Wake Me in Spring, an easy picture book he wrote. Some of the kids got to act out the hiccups as he read Hiccups for Elephant, both experiences kept their interest, and entertained the audience. I was impressed with how well he went with the flow, and adjusted to his audience. One of my favorite stories was the inspiration for chapter 2 of Jigsaw Jones and the Case of the Million Dollar Mystery. The chapter title is "Green Milk" and involves Jigsaw hiding his broccoli in his milk. In the end, he is busted by his dad and has to drink the obnoxious concoction, but I was fascinated by the fact that the whole chapter was based on something Jimmy heard on the radio, one of the Car Talk guys saying, "You can't hide broccoli in a glass of milk." I later told the kids that this is the big difference between a successful author and most of the rest of us. He heard that line as a great story starter, and I just thought it was funny. The day ended in THE PIT. Jimmy paid me the ultimate compliment and asked me to show him how a "pro" would read his brand spankin' new book, Mighty Casey. I chose a fifth grade class that had not heard the book so the reaction would be genuine and fun. We were loud and even broke into a wave as the Delmar Dogs came back to tie the game. It was a perfect way to end the incredible first day of James Preller's visit to Bailey Elementary. So I'm not the resident expert on author visits, but having survived my first one, I think I learned a few things that might help another rookie out there. The first thing I would do is invite James Preller! He was so easy to work with and related to the kids so well, that my job was easy once he arrived. I wonder why I was so tired at the end of the two days? Beyond that advice, here's a list of things that I recommend to anyone arranging an author visit. First, do some research. I was fortunate to have this blog that helped me reach out to authors, but that doesn't mean others can't find out information and get a sense of an author. Most of the current authors have a blog or website of their own. Start reading them on a regular basis, and you will soon get a feel for their personality. Try commenting on their blog and see if you can strike up an internet conversation. That's really where this visit started. Jimmy commented on a review that Karen did, and pretty soon the three of us are having conversations over email. Not only that, but other teachers in our building were leaving comments on his blog starting conversations of their own. By the time we were ready to approach him, I felt pretty sure that he would be easy to work with and fun to be around. Talk with other teachers and librarians to hear their experiences with authors. In fact, if you've had a great author visit post the name in the comments here at Literate Lives with a brief description of your experience. Next, find a couple of hard working parent volunteers to help out. Fortunately for me, the PTO has an author visit committee and the chairs, Amy and Keyburn, were already in place. I invited them in to talk over the visit and pitched some names to them. The first decision we had to make was whether we should stay local, and save money or go for a big national name. In true Bailey fashion, and since we hadn't had an author in 3 years or so, they wanted to go big. I had a list of about five authors that had commented on our blog more than once and some sample of their books. Amy and Keyburn were almost immediately drawn to James Preller, and the invitation was issued. These two incredible ladies then took care of all of the travel and entertainment logistics which is a huge piece of this that I could never have handled as well as they did. The cool thing about working with Jimmy was that I dealt directly with him, no middle person, publicist, agent, etc. It certainly made communication quick and easy. Since I've not worked with an author who has these people, I have nothing to compare it to, but I have to believe it's easier dealing directly with the author. We began an email conversation that took us right up to the day he was flying out of Albany, NY since a big snowstorm threatened his arrival. I learned more about him and how he worked through these notes. Form a teacher advisory committee. I had a group of teachers representing each grade or area in our building. The purpose of this committee was to help me figure out schedules and logistics. I really tried to limit the actual work that these people were responsible for since their plates are already full. Also, I only called meetings if there was something new, or I needed an answer. Teachers are swamped and they don't need one more meeting. Their expertise and help was invaluable. Prepare the kids before the author comes. I've been through enough of these visits from the classroom teacher's position to know that time is valuable and needs to be used wisely. I didn't want the kids taking time with James Preller with a lot of biography type questions so I had every class reading his bio on his web site before he got here. The students already knew about his family, pets, writing history, interests, hobbies, etc. By doing this, I think the kids were able to think of better questions about his books, or the life an author. I also read several samples of his writing as they passed through the library. Many of the teachers took the books their students purchased ahead of time and did classroom activities like book clubs so the students were very familiar with the author's work. I will say this did cause some confusion when distributing the books, but it was minor, and I think the benefits far outweighed the glitches. Don't ask your teachers to do one more thing. From the classroom teacher's standpoint, sometimes these visits turn into more work. It's not that teachers, especially in my building, mind working, it's just that sometimes these visits turn into real dog and pony shows. I didn't ask my staff to make elaborate displays and cover the hallways floor to ceiling with things from the Preller books. Many of the teachers had small, authentic displays that I was sure to show Jimmy and he appreciated them, but honestly, there weren't very many spare minutes for him to look at a lot of hall displays. If possible, pick the author up at the airport if they are coming in from out of town. The parents considered having a limo pick Jimmy up, but I really wanted to do it, and my friend Karen joined me which made it perfect. This gave us a chance to get to know Jimmy a little more before he came to the school. 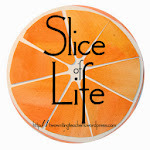 Be sure to read Karen's Slice of Life about this experience. On the day of the visit, help your author get to the school early. This gave me a chance to give Jimmy a tour, introduce him to a few people and take care of any last minute set up things. It also gave him a chance to get a feel for his surroundings for the next two days and to sign a few books before the students arrived. Parent volunteer Amy suggested a dinner at her house rather than a restaurant. This would allow more people to mingle and meet Jimmy in a more relaxed atmosphere. If your author is visiting for more than one day, which I recommend, and you have a parent who is willing and able, this is definitely the way to go. We invited the teacher committee and the PTO executive board and had an incredible evening. Fortunately Jimmy was able to work the crowd comfortably and the PR I gained with the PTO for the next author visit was invaluable. This post is already too long, but just to wrap it up, my biggest piece of advice is to relax and enjoy your time with the author. The conversations I had with Jimmy during the down times were so enjoyable and rewarding. We talked about everything from our kids, to books, to other authors, to teaching. It was time spent that I will long remember fondly. The other day, my partner here (Bill) and I were standing at the Port Columbus airport, looking for James Preller (of Jigsaw Jones, Six Innings, and Along Came Spider fame). That's not as crazy as it sounds. James (we now call him Jimmy!) was coming to our school for an author visit. As Bill and I stood in the deserted terminal, wondering if Jimmy's flight was delayed because of the powerhouse storm in the east last week, we had to keep pinching ourselves. We couldn't believe our good fortune. Two teachers from Dublin, Ohio, had originally met James Preller via reviews that we had both written. It started as a fun correspondence back and forth on our blogs. Then, Jimmy actually interviewed US at one point -- again, US being just two teachers from Dublin who happen to love books and write about them on a blog. Then, Bill was able to secure James Preller for a 2 day author visit, one day where he would do writing workshops with the intermediate students. Well, life just continued to get better. Jimmy managed to make his connection in Detroit, and pretty soon I'm hugging and kissing a man I've never met in person before that night. It quickly became clear to both Bill and me that Jimmy was just as excited about meeting us as we were about meeting him. How fun is that?! We drove him to his hotel, and then the three of us decided to spend some time chatting over drinks. We talked about a wide variety of topics, including our children (all three of us have children, and we each have one in high school). We shared titles of books and talked about the Newbery winners. We talked about the potential uses of blogs, Facebook, and Twitter. But, the main thing that struck me throughout this experience was how our blogs had connected us in the beginning, and our inter-connectedness (is that even a word?) has continued. How fortunate we are in this blogging community to get to know people we might not otherwise have an opportunity to do so. I know Bill and I (and many of our colleagues!) feel very fortunate to have gotten to know the man who is the author. I'm so glad Jimmy was able to make his connection, and Bill and I were there to greet him!! Several weeks ago, Sally at Cover to Cover approached Literate Lives with the chance to interview Leepike Ridge and 100 Cupboards author N.D. Wilson. The sequel to 100 Cupboards, Dandelion Fire, was coming out and his promotional tour would take him through Columbus with a stop at my favorite bookstore. Having never conducted an interview, I was a bit apprehensive, but couldn’t pass up the chance to talk to the author of one of my favorite books from 2008. I had even included Leepike Ridge on my Newbery picks for A Year of Reading, so I agreed to give it a shot. I sat down with N.D. Wilson, the N. stands for Nathan, by the way, on February 28 in the interrogation room at Cover to Cover. LL: Great to meet you. Just a warning, I’ve never done one of these things before, so if I say or do something stupid, just hit me and let me know. 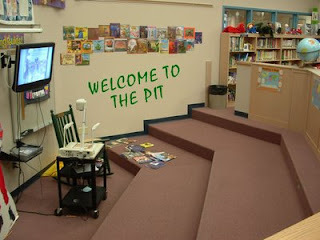 My blogging partner, Karen, isn’t abl e to be here today, but her class just finished using Leepike Ridge as a read aloud. I sat down with them, talked about the book, which they loved and looked over your bio. They came up with a few questions that I told them I would try to work into the interview. Jessica wants to know how your father “accidently” became a pastor. NDW: Interesting that she would pick up on that word! My parents were hippie Jesus People, and my dad was the guy up front with the guitar leading the singing. The church met in an old auto body shop, and when the original pastor decided to move on one Sunday, the rest of the church told my dad he should take over. He tried not to, but he was the guy up front with the guitar so in between songs he would pastor, and all these years later he’s still at it! LL: Jonathan wondered if Tom floating down stream on Styrofoam was inspired by your childhood adventure. NDW: Absolutely! Of course at the time I wasn’t planning to put it into a story, but my friend and I found the pieces of Styrofoam and decided it would be a good idea to ride them down the stream. It was right before a baseball game because I remember we were in our uniforms and cleats. LL: How long did you float? NDW: Seemed like a long time to us. My friend’s mom found us squelching our way back home in our wet uniforms and cleats. They came looking for us when we didn’t show up at the game, I guess. LL: Hannah asks if the settings in Leepike Ridge are based on real places? NDW: Interesting that the book, if you follow the clues, is actually set in the Northeast, but the descriptions of the settings are mostly from places in eastern Washington and the Snake River in Idaho, but yes, the rivers and caverns are definitely based on real places. LL: Elizabeth asks are the characters of Tom (Leepike Ridge) and Henry (100 Cupboards Trilogy) adventurous because you were? NDW: They are. They are both adventurous and cautious, same as any kid. I enjoyed exploring and a little bit of adventure, but I also had enough fear to make me cautious. Henry’s character is a little more timid and cautious as compared to Henrietta who is more rash and lets just do it kind of thinking. Most of my characters have pieces of people I know in them. LL: I think I see Henry growing a little bolder as Dandelion Fire goes on. NDW: Definitely, you can even see it in 100 Cupboards, starting with when he learns to play baseball and gains confidence in that. LL: Leepike Ridge is such a great adventure and suspense story that kids love, and then you jumped genres and write a fantasy trilogy, how does that happen? NDW: Actually 100 Cupboards was written first as a 700+ page novel. I knew it was too long and wasn’t really happy with it, but it got submitted before I was really ready for it to be. As the publisher was going over it, the idea of Leepike Ridge popped into my head and I wrote it in about 3 weeks. Then I decided I needed to turn 100 Cupboards into a trilogy, because what I had written was really a story in 3 acts, and the publisher accepted all four. LL: Regular readers of Literate Lives know that I’m not a fantasy reader, but have been stretched in this area since becoming a librarian. When I read this stuff I can’t help but wonder, where do these ideas come from? I find myself re-reading parts and just shaking my head when I read some fantasy stories. So, where does it come from? NDW: When I started the 100 Cupboards trilogy I was attempting to Americanize children’s fantasy. I’m a bit nervous about saying it because if I didn’t accomplish that it could be dangerous. But some of the things I was trying to do were to put the fantasy in an American setting, not an English boarding school, or put on a fake English attitude. So what’s more American than wheat fields, baseball, big red barns. I put it in Kansas because Kansas already has a history of the setting of American fantasy. The second thing I wanted to do was write so that kids weren’t bummed out when they finished the book. As a kid I remember reading The Chronicles of Narnia and being disappointed when I was finished because that world didn’t exist outside of the book. So I was trying to write so that when a kid finishes my books, they are excited about finding the magic in this world, like caterpillars really do turn into butterflies, and grass grows out of thin air with the help of that big ball of fire in the sky, and how does a several ton steel object fly when we light the engines on fire. I want my books to encourage kids to get outside and explore their magical world like my sisters and I did growing up! LL: I’m about three-fourths of the way through Dandelion Fire and it seems to me to be a bit darker and heavier than 100 Cupboards. 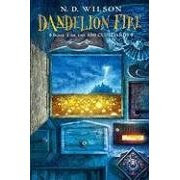 There’s always this debate with librarians and teachers about what age a book is written for, what age do you think Dandelion Fire is for? NDW: I’m not sure I agree with the adjective “darker” some scenes are definitely darker, but I think the book is just more intense than 100 Cupboards. I really see Cupboards as the darker of the two. As far as reading age, it’s tough to have that in mind when your writing the book. I can’t sit down and say I’m writing a fantasy book and it’s for 10 or 11 year olds. It’s also tough to generalize for readers, for instance, my 6 year old has heard the entire book and loves it. But if I was going to say I’d say 10 might be the low end of the age group for Dandelion Fire. LL: I agree, I have a few 5th graders that will be able to read it and get it on their own, but not too many students younger than that. Last few questions. Who are your favorite current authors or books? NDW: I love Holes. I’ve read it several times and love it every time. It’s about as close to a perfect book as I’ve read. I also like Terry Pratchett and Neil Gaiman, his books aren’t my favorite type, but the wordsmithing is incredible. LL: You have 4 kids, oldest 6. What do you read to them? NDW: Actually my wife reads to them mostly. My 6 year old has heard both 100 Cupboards books and can’t wait to hear what comes next. I’ve done my time with Sox on Fox and the fuzzy sheep sing La, La, La, but my kids like me to tell them stories. Each one gives me something to put into the story and then I have to immediately turn around and make up a story using all of those things. Some of them go on for 45 minutes or so. LL: Will any of them turn into a book? NDW: Some of them already have! I stuck around to listen to his public presentation and picked up a few tidbits that I neglected to ask about, and some things I never would have thought to ask about. -The opening of Leepike Ridge came to him while brushing his teeth and the first few paragraphs were written with a mouthful of tooth paste and the brush hanging out of his mouth. -Book 3 in the 100 Cupboard trilogy is called The Chestnut King and should be out in about a year. -He’s currently working on another book in the Leepike Ridge vein called Muck Flats and set in Florida. -The idea of 100 Cupboards came from a late night conversation with his college roommate and his wife.